He would have probably thought out loud the meanings of all these Tagalog words! With Ed Sheeran’s recent visit here in Manila, some fans had the most wonderful opportunity to meet him, including celebrity family, the Kramers! The video features family man Doug Kramer with his daughter Kendra meeting the 27-year-old British musician before the concert. As the Kramers walk their way to a white tent where they meet the singer, Kendra tells her dad that she is “so nervous right now, I can’t believe how nervous I am” – but she does look excited! Doug explains to Ed that he has been teaching Kendra Tagalog words, and asks the singer if he knows some, to which Ed responds with a head shake. “I want to teach you some Tagalog words,” Kendra says, and holds up sheets of paper with Tagalog words written there for Ed to read out loud. What do you think of this challenge? Let us know in the comments below! 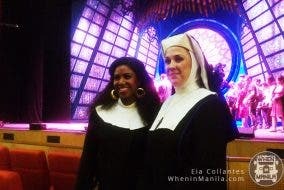 Sister Act the Musical: 6 Reasons to Go Watch it Now!